Gerald D. Kennedy, 87, of K. E. Spencer Memorial Home, passed away peacefully at his residence on Friday, February 8, 2019. Born in Moncton, he was the son of the late William and Ruth (MacLeod) Kennedy. He retired in January 1992, after 35 years as Atlantic District Sales Manager with the Champion Spark Plug Company Limited. He served with the Royal Canadian Navy. 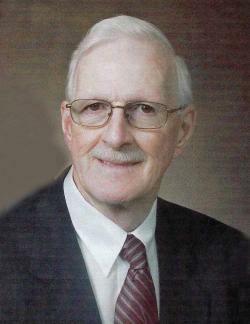 A former Board member of the Naval Veteran’s Association; a former Board member of the Y’s Men’s Club; a former Board member of the Beaver Curling Club; a former volunteer at the Karing Kitchen; a member of Council at St. John’s United Church; Life member of the Canadian Professional Sales Association; past Chairman of the Automotive Industries Association – Atlantic Division; past President of the Gyro Club of Moncton; past President of the Moncton Duplicate Bridge Club. He is survived by two daughters, Deborah Crawford (Rick) of Halifax, NS and Sharon Kennedy of Caissie Cape; one son, Michael MacLean (Suzanne), of Ottawa, ON; several grandchildren and great grandchildren; sisters, Mary Slack (late David) of Oshawa, ON and Gloria Wilson; several nieces and nephews. In addition to his parents, he was predeceased by his beloved wife, Margaret (Martin) Kennedy (July 2018) and one grand daughter. A Service to celebrate and honour Gerald’s life will be held at Fergusons Funeral Home Chapel, 1657 Mountain Road, Moncton (858-1995) on Wednesday, February 13, 2019 at 2:00 pm, with The Rev. Aaron Billard leading the service, followed by a reception in the Funeral Home Reception Centre. Interment will be in Fair Haven Memorial Gardens.